26-Jul-2010 -- Finally: after 1 year and 3 months of confluence hunting around Thailand, an opportunity for my first successful CP visit in my home country. Being born not far from 51.5N 10E (i.e. Göttingen), it was to be either 51N 10E or 52N 10E for me on this short 10-day stay with my parents. But then there was no good reason to venture into the direction of 51N 10E and anyway, it is in Hesse. Please! You really expect me to go there, as someone from Lower Saxony? 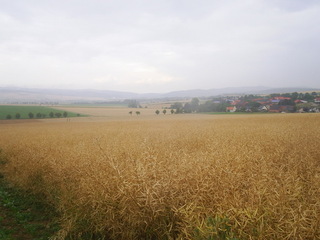 So after visiting relatives in Hildesheim together with my father, we took a couple of country roads to Bad Salzdetfurth and then south to Bodenburg and Sehlem, approx. 2.2 km from the confluence. Just before entering Sehlem, a small road to Evensen branches off in eastern direction. At a sharp 90° bend shortly before the village, 400 m from the CP, a farm track continues uphill to the edge of the forest. It is actually closed to cars and reserved for agricultural vehicles, but we just kept driving (don't tell anybody! ), as it had recently started to rain. Once inside the forest, we turned around and parked the car - with 150 m to go to the confluence. But as I had immediately spotted the little monument (or rather, the fence surrounding it) that earlier visitors had mentioned, I went there first to take a few photos. As already explained somewhere, its location is based on the German (Gauss-Krueger) grid system's reference ellipsoid (Potsdam datum), and thus it is to be found some 200 m southwest of the 'WGS84' confluence. After that, I took my father on the short walk along the forest edge to his very first CP visit. Despite the poor weather, the satellite reception was good (EPE=5 m). The only problem was that the field containing the confluence was full of rapeseed plants, up to 1.5 m high. So in order not to damage the crop (and it would have been quite difficult to make one's way through those sturdy plants, anyway), we followed the western parcel boundary in northwestern direction until we reached 52°N latitude. We were then at 9°59.959E, i.e. about 47 m due west of the point. Good enough for this time. A few quick photos (as dull as the weather) and back to the car we went to clean our soiled shoes, followed by a drive through Evensen and on to the A7 motorway at Rhüden. #6: First confluence for my father!